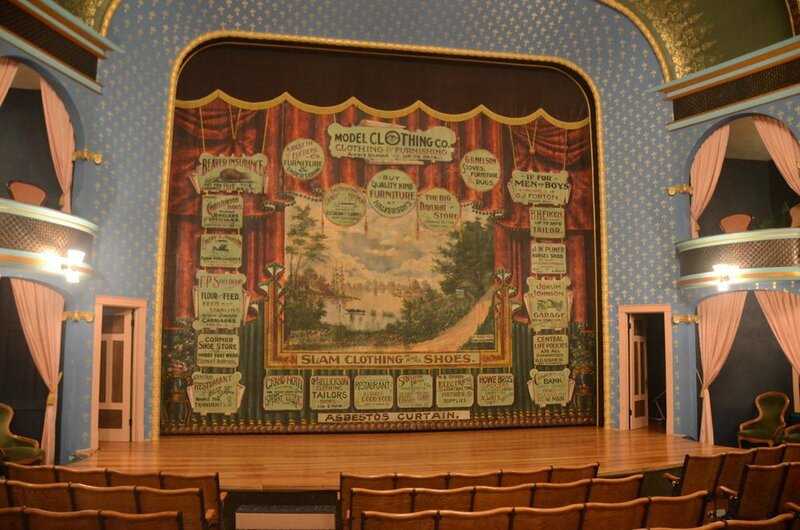 The theater's original curtain still hangs over the stage, greeting Opera House audiences with vintage advertisements for local businesses of years-gone-by. Image courtesy Milwaukee Journal Sentinel. The Stoughton Opera House opened on February 22, 1901 and was originally known as the City Auditorium. The theater's debut show was Ullie Akerstrom's comic play, The Doctor's Warm Reception. For over 50 years, the Opera House was the hub of Stoughton's arts and culture scene, hosting not only plays and musical performances, but political rallies, temperance speeches, high school graduations, and more. In the middle of the 20th century, the theater fell into ruin and was closed; however, the town did not give up hope on the historic space. In the 1980s, the city and local citizens decided to save the building and restore it to its former glory. Today, the venue is used once again for myriad events, and is a cornerstone of Stoughton's arts community. Find out more about the historic building at the Stoughton Opera House website. The Stoughton Opera House is the heart of the creative economy in Stoughton. The Opera House draws over 20,000 visitors to Stoughton's vibrant downtown each year. These visitors not only attend shows, but also patronize local businesses in Stoughton. This influx of visitors brings substantial revenue for Stoughton's economy. In addition to the $600,000+ generated by ticket sales at the Opera House each year, studies show that event-related spending by arts patrons averages nearly $20 per person in additional spending for hotels, restaurants, parking, souvenirs, refreshments, and more. Non-local attendees spend significantly more than local attendees. It is estimated that the Opera House generates upwards of $787,000 in revenue for the businesses within town of Stoughton. "The arts are a bustling industry that supports a plethora of diverse jobs, generates significant revenues for local businesses and to federal, state, and local governments, and provides quality of life that positions communities to compete in our 21st century creative economy"